07/02/14 -- EU grains finished mostly higher on the day, and with some half decent gains for the week. Paris wheat seems to have found a floor at EUR190/tonne, at least for the time being. Likewise old crop London wheat at around GBP150/tonne and new crop at around GBP140/tonne. The session closed with Mar 14 London wheat ending up GBP0.50/tonne at GBP154.50/tonne, whilst new crop Nov 14 London wheat ending GBP0.30/tonne firmer at GBP146.05/tonne. Mar 14 Paris wheat was EUR0.75/tonne steadier at EUR194.75/tonne, Mar 14 Paris corn was unchanged at EUR174.50/tonne, whilst May 14 Paris rapeseed fell EUR1.50/tonne to EUR376.25/tonne, but still managed to post a respectable EUR14.00/tonne gain for the week. Old crop Mar 14 London wheat gained GBP5.00/tonne versus last Friday, with new crop Nov 14 up GBP3.30/tonne. Mar 14 Paris wheat finished the week EUR2.25/tonne higher than it began it, whilst Mar 14 corn added EUR1.00/tonne for the week. As you can see, London wheat fared better than it's Parisian counterpart largely due to a decline in sterling which fell close to 1.20 against the euro versus nearly 1.22 last Friday. Having spent all of January in decline, the wheat market appears to have found its level and now wants to trade sideways until more is known about world production prospects for 2014 later in the spring. The Russian and Ukraine Ministries say that all is well, the Russians said this week that 65% of their winter crops are in good condition, with 31% satisfactory and only 4% poor. 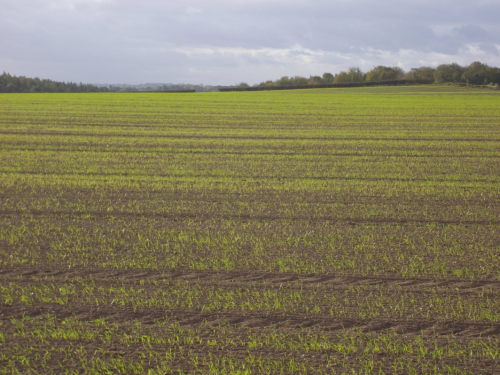 Ukraine said that 58% of their winter crops are "good" and a further 36% "satisfactory" - leaving 8% rated as "weak/thinned" - some of which will be replanted when spring arrives. Come the spring we will also have a better handle on the EU supply and demand balances. 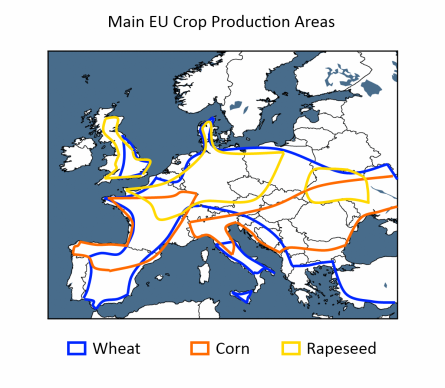 Currently, as we all know, EU wheat exports are racing ahead, with export licences already granted for 18.2 MMT of soft wheat, 490 TMT of wheat flour and 425 TMT of durum. Combined, that's 73.5% of the USDA's forecast for the season. As wheat goes out, corn comes in. Brussels have also granted corn import licences to the tune of 7.4 MMT so far this season, or 82% of the USDA's target for the marketing year. In the UK specifically, it seems pretty likely that the current official estimates from Defra are understating both corn and wheat import totals and overstating wheat demand from the Human & Industrial sector - particularly from the bioethanol industry. Vivergo are still only stumbling along and Ensus are said to be using more corn than they are wheat at the moment. Feed manufacturers also currently have all sorts of other options open to them rather that to buy wheat, with the likes of wheatfeed, barley and oats all offered at substantial discounts to wheat. There may therefore be more wheat around domestically come the spring than the market currently expects in such a low production year. Generally speaking though it is probably going to take a rise of more than GBP5.00/tonne, from what was after all a 25-month low, to entice those sitting on old crop wheat to part with it now. If the market wants it, then the market is going to have to pay up for it, right? That also probably seemed like a very good strategy 12 months ago. On this very day in 2013 the May 13 London wheat contact commanded a premium of almost GBP23.00/tonne over new crop Nov 13. By the time the May contract expired it was trading at a GBP2.00/tonne discount to the new crop - a very impressive fall from grace. 06/02/14 -- Soycomplex: Beans closed higher on continued strong demand. Weekly export sales came in at 577,000 MT for old crop and 219,500 MT for new crop. China took 436,400 MT of the old crop, including 180,000 MT switched from unknown destinations. There were cancellations of 530,500 MT of old crop, but nevertheless net sales of 577,000 MT and shipments this week of 1,508,100 MT take the total 2013/14 season commitments to 43 MMT. That gives the USDA an interesting problem to resolve in Monday's upcoming WASDE report, as they currently only estimate exports for the entire season at 40.7 MMT, and we still have 7 months of 2013/14 left to run! Note that 78% of the USDA's current export estimate has already been shipped. Very strong demand for meal is also keeping the domestic US soybean crush high, further eating into US soybean disappearance. The FAO increased their world soybean production forecast by 3 MMT from last time to 289 MMT, which is also 2 MMT more than the USDA's January forecast. They only see world ending stocks at 34 MMT, less than half the 72 MMT currently forecast by the USDA. FC Stone estimated Brazil’s 2013/14 soybean crop at 90.3 MMT versus a previous estimate of 90.2 MMT and 89 MMT from Washington. There are some suggestions that developing adverse weather in Brazil could take the shine off yields, especially in the south of the country. "Rainfall the past 2 weeks has dried up in South Brazil. Parana and Rio Grande do Sul may suffer reduced yields if rainfall does not increase very soon, placing 30% of Brazil soybeans in jeopardy. February rainfall is highly significant for the soybean yield as this is the main pod filling stage. Both the size and number of beans in the pod would shrink if drought worsens. Hot temperatures in South Brazil have further increased moisture stress this month. Temperatures frequently topped 90 F often reaching 95 F," said Martell Crop Projections. Mar 14 Soybeans closed at $13.25 3/4, up 9 1/2 cents; May 14 Soybeans closed at $13.11 3/4, up 12 1/4 cents; Mar 14 Soybean Meal closed at $446.00, up $4.00; Mar 14 Soybean Oil closed at 38.66, up 43 points. Corn: The corn market was narrowly mixed, despite a second week of very impressive export statistics. The USDA reported old crop US corn sales of 1.7 MMT, up 94% on the previous 4-week average. Yesterday they also reported 185,928 MT of US corn sold to unknown destination for the 2013/14 season and 50,800 MT for the 2014/15 season. Taking the shine off those sales was news from the USDA announcing 220,000 MT of US corn sold to China for 2013/14 shipment had been cancelled, presumably due to the ongoing problem with rejections of corn shipments containing the non-approved MIR 162 variety is still to be resolved. Total US corn export commitments for 2013/14 are now 33.5 MMT versus a USDA full season export projection of 37 MMT, which is 90.5% of that total. The FAO pegged the 2013/14 global corn crop at one billion tonnes, up 14.3% on a year ago. They see ending stocks at 175 MMT versus 132 MMT last year and 160 MMT from the USDA. FC Stone estimated Brazil’s 2013/14 corn crop at 72.2 MMT versus a previous estimate of 72.4 MMT and 70 MMT from the USDA. They see Brazil’s 2013/14 corn ending stocks at 7.08 MMT versus 9.81 MMT from the USDA. Problems persist for corn potential in Argentina. "Corn prospects in Argentina are way worse than soybeans. The majority of corn pollinated under severe moisture stress in January, before drought breaking rains developed. This caused severe and irreversible damage to the corn yield, as kernels not successfully pollinated would never develop into grain. A significant amount of corn was planted late, having shallow roots, when drought and heat stress developed. Corn stunted by drought had small ears. Damage to corn was most severe in Buenos Aires the top corn producing province," said Martell Crop Projections. The USDA attaché in Mexico estimated their 2013/14 corn crop at 21.5 MMT versus the official USDA figure of 21.7 MMT. Mar 14 Corn closed at $4.43, down 1/4 cent; May 14 Corn closed at $4.48 1/2, up 1 cent. Wheat: The wheat market put in a strange close across the three exchanges, ending anywhere from 6 cents lower to 8 cents higher. Weekly export sales of 638,800 MT for delivery during the 2013/14 marketing year were down 15 percent from the previous week, but up 62 percent from the prior 4-week average. There were also net sales of 94,800 MT for 2014/15. Brazil (82,500 MT, including 25,000 MT switched from unknown destinations) showed up amongst the old crop sales. Total commitments for 2013/14 now stand at 26.7 MMT, or 87.5% of the USDA's target of 30.5 MMT for the season. The 5-year average for this time of year is 84%, so things are a little better than normal, but not dramatically so. Japan bought bought 312,816 MT of wheat for March – June shipment, split between US, Canadian and Australian origin. Oman bought 20,000 MT of Indian wheat for March/April shipment. The FAO increased their world wheat production estimate by by 3 million tonnes, reflecting bigger crops in Canada. The wheat usage forecast for 2013/14 was lowered slightly compared to the previous report mainly on downward adjustments in feed use of wheat in the US, they said. World wheat ending stocks were pegged at 176 MMT, up 11.4% on 2012/13. "In the US, winter wheat is overall in good condition and seeded area is slightly down relative to last season. Continued dryness across the Southern Plains is raising concern over the dormant crop, particularly in areas that have experienced colder than normal temperatures and lack protective snow cover," they added. As far as wheat prices go "reports from Canada of wheat oversupply and from India of expectation of a bumper crop in 2014 added to the downward pressure (last month)", they noted. Mar 14 CBOT Wheat closed at $5.80 3/4, down 6 3/4 cents; Mar 14 KCBT Wheat closed at $6.48 3/4, down 2 1/2 cents; Mar 14 MGEX Wheat closed at $6.38 1/4, up 8 3/4 cents. 06/02/14 -- EU grains were flat to mostly a little higher, in relatively quiet trade, with another solid week of export figures underpinning the market. Mar 14 London wheat ended unchanged at GBP153.80/tonne, whilst new crop Nov 14 gained GBP0.25/tonne to GBP145.75/tonne. Mar 14 Paris wheat was unchanged at EUR194.00/tonne, as was Mar 14 Paris corn at EUR174.50/tonne, whilst May 14 Paris rapeseed rose EUR2.75/tonne gain to EUR377.25/tonne. Brussels confirmed another bumper week of soft wheat export licences, granting 872 TMT worth. That takes the season's total so far to 18.2 MMT, up more than 55% on 11.7 MMT this time a year ago. For once the export number far outstripped the volume of corn import licences issued. That total came in at 288 TMT, bringing the cumulative total for the season so far to 7.4 MMT. The FAO's February AMIS Market Monitor reported this year's global wheat crop at a record 714 MMT, up 3 MMT on their previous estimate and 1 MMT above that of the USDA. Ending stocks were increased 4 MMT from December to 176 MMT, which is 11% more than last season. The 2013/14 world corn crop was placed at a cool 1 billion tonnes, 125 MMT up on a year ago, and also unsurprisingly a record. World corn ending stocks were estimated at 175 MMT, up by a third on those at the end of 2012/13. "In Ukraine and Russia overall conditions are favourable at this early stage of the season and the crop is in the dormancy phase. Towards the end of the month, cold weather moved into the region and wide-spread snow covered much of the wheat areas providing a protective layer against frost and winterkill. Limited areas in central, southern and eastern Ukraine as well as in southern Russia, where protective snow cover is low, are more susceptible to frost damage in the event of extreme cold temperatures. However, to date wide-spread frost damage has not been reported," they said. "In the EU overall conditions are favourable. 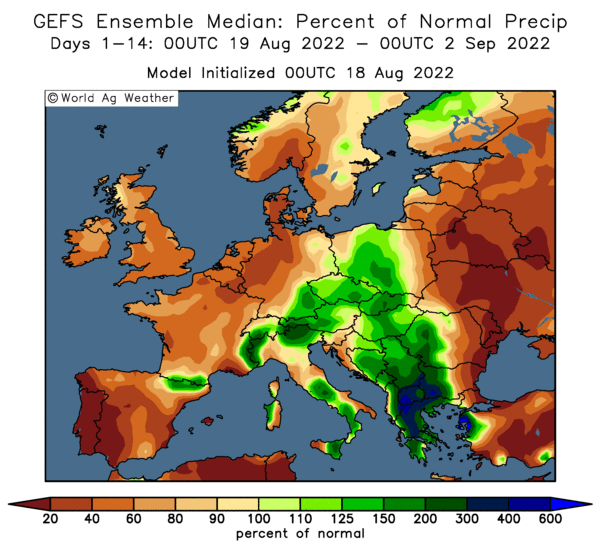 However, since mid-December most areas experienced exceptionally mild temperatures, which have significantly delayed hardening of winter wheat from Ireland to Poland, resulting in a decreased tolerance to future frosts," they added. They wrapped up a general view that there isn't anything majorly threatening for the global wheat crop at the moment by saying "In India, wheat is in the reproductive phase and conditions are good. A bumper crop is projected due to an increase in planted area. In Pakistan, mild weather is supporting favourable wheat conditions. In China, conditions are favourable for the dormant wheat crop. In the southern hemisphere harvest is complete." The Kazakhstan Statistics Agency said that their 2013 grain crop was 18.2 MMT, up 42% from 2012. That included 13.9 MMT of wheat, also up 42% from a year ago. The Russian Ag Minister said that Russia's 2013 grain harvest exceeded the official Rosstat estimate of 91.3 MMT in clean weight without giving a figure of his own. Russian farmers are a little economical with the truth when declaring their production figures to the government he suggested. The very idea! Winter crop losses this year will not exceed 5%, he said, sticking by his first forecast for a grain crop of 95 MMT for 2014/15. Cynics would say that the government always start off with an estimate of 95 MMT. In Ukraine, the local Ministry in Crimea said that 79.8% of winter crops were in good condition, with a further 19.5% said to be satisfactory. 05/02/14 -- Heading towards the close of trading, EU wheat futures had recovered from a morning bout of lower consolidation following yesterday's gains and were back into positive territory. May 14 London wheat traded GBP0.75/tonne higher at GBP156.00/tonne, whilst new crop Nov 14 was also GBP0.75/tonne firmer at GBP146.00/tonne. Paris traded with Mar 14 wheat up EUR0.75/tonne at EUR195.00/tonne, with Mar 14 Paris corn unchanged EUR174.00/tonne and May 14 Paris rapeseed EUR0.75/tonne higher at EUR372.25/tonne. The market remains concerned about the steep drop in wheat crop condition ratings in some of the leading producing states in the US, and there is also some heightened talk of winterkill issues in Ukraine. 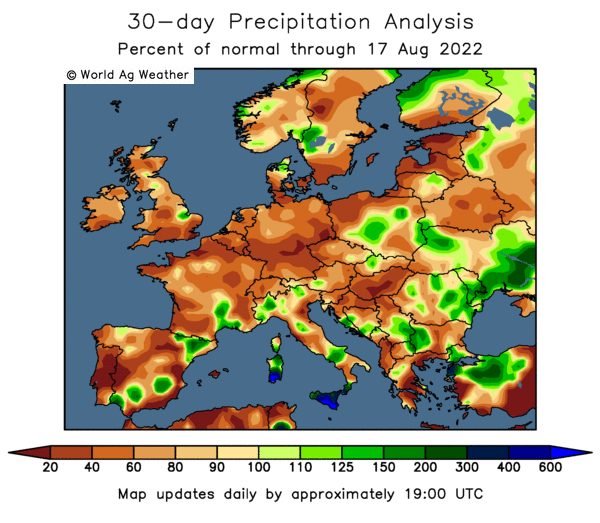 "The cold wave recorded last week in Ukraine has certainly damaged winter crops," said Agritel. Air temperatures (in Ukraine) fell to minus 20 C last week, leading a drop in soil temperatures to nearly minus 17 degrees, "which is a critical temperature for wheat", they said according to Agrimoney.com. 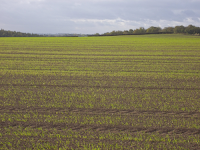 Any wheat considered not viable can of course be replanted in the spring, although it's more likely to be with corn or barley, or even oilseeds, rather than spring wheat. Not everybody agrees. The Ukraine Ministry yesterday said that winter crops were 92% good/satisfactory, and the USDA's office in Ukraine also played down damage potential. In Russia, the Ag Ministry there said that 65% of winter crops were in "good" condition, with a further 31% "satisfactory" and only 4% in a "poor" state. Russia picked up less than 10 TMT in their second round of intervention purchases of the week today, taking the total volume bought so far to just under 600 TMT - a far cry from their original intentions. This isn't necessarily bullish news, as it may suggest that growers feel that the export market offers them potentially more lucrative returns. Informa yesterday estimated the 2014/15 global wheat crop at 707.8 MMT, down slightly from a previous estimate of 708.2 MMT and a little below the 2013/14 crop of 713.3 MMT. 04/02/14 -- Soycomplex: Beans were sharply higher, and so too was meal, with front month Mar 14 meal setting a lifetime contract high. There's still no sign of the much touted Chinese cancellations, and with the Lunar New Year celebrations ongoing then they may not show up in Thursday's weekly export sales report either. As well as fretting over Argentine soybean production and adverse weather conditions, there's now talk of heat and dryness issues in southern Brazil. Agrimoney today report "up to 5 MMT of Brazilian soybean output is at risk from the heatwave which has already sent coffee prices soaring, influential crop scout Michael Cordonnier said." Dr Cordonnier said "the month of January will go into the record books as one of the hottest month ever recorded for many cities in southern Brazil including Sao Paulo, Rio de Janeiro, Curitiba (the capital of Parana), Florianopolis (the capital of Santa Catarina), and Porto Alegre (the capital of Rio Grande do Sul)." Nevertheless, he stuck by his forecast for a Brazilian soybean crop of a record 90 MMT this year, at least for now. Informa today raised their forecast for Brazilian soybean production from 88.7 MMT to 89.7 MMT, although they cut Argentina's prospects from 57.5 MMT to 57 MMT. As Argentine farmers continue to sit on beans from last year's crop, meal availability out of South America is very tight. Argentina are traditionally the world's largest soymeal exporter, you will recall. Brazil appear to be leaning towards concentrating their export efforts more on beans than meal these days. Hence a very buoyant US soymeal market (and why soyoil values are near, 3 1/2 year lows). Stats Canada estimated Canadian canola stocks as at Dec 31 at a record 12.6 MMT, versus the expected 12.3 MMT and up more than 55% on 8.1 MMT a year previously. Mar 14 Soybeans closed at $13.13 1/4, up 20 1/2 cents; May 14 Soybeans closed at $12.97 1/2, up 19 1/4 cents; Mar 14 Soybean Meal closed at $447.00, up $13.00; Mar 14 Soybean Oil closed at 37.71, up 26 points. Corn: The corn market closed with gains of around 6 cents, and with the nearby Mar 14 contract settling at its best level since mid-November. With reference to the potential problems in Brazil, Dr Cordonnier said that "full-season corn has probably been the crop most impacted by the hot and dry conditions. The state of Minas Gerais has the most full-season corn acreage in Brazil and there have been numerous reports of significant moisture stress impacting the corn crop in the state. The full-season corn crops in Sao Paulo and northern Parana have also suffered under the adverse conditions." Again though he still pegged the Brazilian corn crop at 68.5 MMT, unchanged from his previous estimate. Likewise, Argentina's corn crop was estimated at 22.5 MMT, also unchanged from previously. Informa on the other hand cut their forecasts for both countries, coming in 2 MMT lower than Dr Cordonnier in Brazil, and broadly now agreeing with his Argentine forecast. They cut Brazil from 67.5 MMT to 66.5 MMT, and wiped 2.4 MMT off potential Argentine production, going from 25 MMT to 22.6 MMT. The USDA are currently at 70 MMT and 25 MMT respectively. In their first preliminary peek into 2014/15, the Ukraine Ministry estimated corn production there at 30.2 MMT, down 2.2% from last year. On the international tender front, South Korea's NOFI bought 65,000 MT of US corn for June shipment. US corn export sales continue to run well ahead of schedule, although actual shipments themselves are only in line with normal levels at 39.6% of the USDA forecast for the season as compared with 39.2% as the 5-year average for this time of the year. Analysts are expecting the USDA to raise US corn exports estimate by around 50 million bushels in next Monday's WASDE report. Stats Canada reported Dec 31 Canadian corn stocks of 11.5 MMT, a 10.6% rise on a year previously. The US Energy Dept will release their weekly ethanol production data tomorrow. Mar 14 Corn closed at $4.41 3/4, up 6 cents; May 14 Corn closed at $4.47 3/4, up 6 cents. Wheat: The wheat market closed sharply higher, as a steep decline in US crop conditions sparked fund short-covering. News overnight that Kansas winter wheat was now only rated 35% good/excellent, versus 58% a month ago and 63% at the end of November took the trade by surprise. Kansas is the largest US winter wheat state, followed by Oklahoma in second. Oklahoma's crop has also seen a steep decline in crop conditions across the winter, now at 36% good/excellent from 63% just a month ago and 77% at the end of November. Stats Canada estimated Canadian all wheat stocks as at the end of December at 28.4 MMT, which was up sharply on 20.6 MMT a year previously, but was actually half a million less than the trade was expecting. The Ukraine Ag Ministry said that Ukraine had exported 2.79 MMT of grain in January, down 40% from December. How much of this decline is due to bad weather interrupting transport and dockside logistics, civil unrest and government turmoil, or simply stocks running low is unclear. There's persistent talk of frost damage to winter crops in Ukraine, although the Ministry are playing these rumours down. They said that 92% of winter crops are in good/satisfactory condition and issued a preliminary forecast for a 2014/15 Ukraine wheat crop of 21.2 MMT, down only 1% from last year. They estimate 2014/14 barley production at 8.3 MMT, up 10% from last year. Informa estimated Argentina's ‘13/14 wheat crop at 10.0 MMT versus a previous estimate of 9.8 MMT. They pegged India’s 2014/15 wheat crop at a record 99.0 MMT versus a previous estimate of 96.6 MMT. Russia's intervention grain purchases have dried right up, they only bought 4,590 MT today, taking the total bought to date to just 588 TMT out of declared original intention of 5-6 MMT. The sharp decline in value of the Russian rouble is suddenly re-opening the export door for Russian wheat. Mar 14 CBOT Wheat closed at $5.84 1/2, up 20 3/4 cents; Mar 14 KCBT Wheat closed at $6.46 1/2, up 22 1/4 cents; Mar 14 MGEX Wheat closed at $6.23 1/2, up 12 3/4 cents. 04/02/14 -- EU grains finished higher as Stats Canada provided the market with a "is the glass half full, or half empty" sort of a moment. It might be difficult to see how a 38% hike in Canadian wheat stocks is bullish, except when you consider that the market was expecting the figure to come in even higher. Things closed with Mar 14 London wheat ending up GBP2.50/tonne at GBP153.50/tonne, whilst new crop Nov 14 London wheat ending GBP1.70/tonne firmer at GBP145.25/tonne. Mar 14 Paris wheat was EUR2.25/tonne steadier at EUR194.25/tonne, Mar 14 Paris corn was up EUR1.00/tonne to EUR174.00/tonne, whilst May 14 Paris rapeseed jumped EUR7.00/tonne higher at EUR371.50/tonne - the highest close on the front month continuous chart since Dec 9. It may simply be that the Canadian news was enough to spark a bit of short covering in CBOT wheat, which spilt over into European trade. Friday's commitment of traders report shows trend following funds (noncommercials net of Index Funds) were short 96,005 contracts on CBOT wheat, close to the record of 103,996 contracts, as of last Tuesday night. Dec 31 Canadian wheat stocks of 28.4 MMT were half a million below expectations, although sharply higher than 20.6 MMT a year previously. Canadian barley stocks were also higher than a year ago, but below expectations. Canola stocks beat both however, coming in at 12.6 MMT versus the 12.3 MMT expected and 8.1 MMT a year previously. A more significant deal, as far as wheat is concerned, was probably the latest monthly update on crop conditions in the US. They showed winter wheat in Kansas only rated 35% good/excellent at the end of January. A month ago that figure was 58% and at the end of November, when the USDA stopped issuing weekly crop condition reports, Kansas wheat was heading into winter dormancy rated 63% good/excellent. There was a similar fall from grace for wheat in Oklahoma, down to 36% from 63% at the turn of the year and 77% at the end of November. Another freeze is on the way for the region this wek, once more raising winter kill fears for wheat without any snow covering. Russia only managed to pick up less than 5,000 MT of wheat in it's regular twice weekly intervention purchase. The Russian rouble is another global currency to hit the skids lately, down to its lowest since March 2009 versus the US dollar. This appears to be making selling for export more attractive, hence the recent poor showing achieved at the government's intervention buying rounds since the turn of the year. 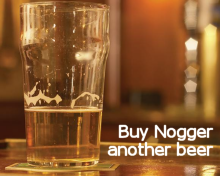 Exports might pick up on the back of it though, when the weather improves at least. Reuters reported that Russia had around 3.4 MMT of wheat left to export in 2013/14, having shipped 12.9 MMT so far this marketing year (to Jan 19). The Ukraine Ministry said that 58% of the nation's winter crops are in good condition, 34% are satisfactory and 8% weak/thinned. The worst affected regions are said to be Kharkov (16% weak/thinned), Zaporozhe (12%) and Kherson (11%). Separately, the local Dept of Agriculture in the Sumy region said that 25% of winter grains had suffered damage due to series of hard and lingering frost and lack of adequate protective snow cover. The Ukraine Ministry said, in their first tentative projection for 2014, that the country would produce 62.1 MMT of grains this year - a small 1.4% decline on last year. They estimate the 2014/15 Ukraine wheat crop at 21.2 MMT (down 1%), with corn production seen 2.2% lower at 30.2 MMT and this year's barley crop up by 10% to 8.3 MMT - presumably as a result of increased spring plantings (you will recall that not all the intended winter grain area got into the ground back in the autumn). They also estimated the 2014/14 Ukraine rapeseed crop at 2.1 MMT, down 12.9%, with the sunflower crop at 9.3 MMT, down 15.4%. 03/02/14 -- Soycomplex: Beans closed around 10 cents higher on the day in relatively quiet trade. China are on holiday, which might mean that the much talked about cancellations are deferred for at least a few more days. There's also talk that vessel line-ups in Brazil are already starting to build. IMEA said that the soybean harvest in Brazil's top producing state of Mato Grosso is 10.6% done versus 5.8% a week ago and 11.4% this time last year. There's talk of some far better than expected yields in Mato Grosso, with early short cycle beans producing up to 70 (60kg) sacks per hectare. Local analysts Agroconsult last week estimated the Brazilian corn crop at a record 91.6 MMT, and they were using an average yield estimate for Mato Grosso a third less than 70 sacks/ha, according to Reuters. AgRural said that nationally the Brazilian bean harvest is 6% complete. Dereal said that Brazil's Parana state was in for a record 16.48 MMT soybean harvest. There's talk of Argentine government intervention to "encourage" farmers to sell old crop beans. There's also talk of some growers having to sell by the end of March to pay tax bills and cover input costs. The USDA confirmed 40 TMT of soyoil sold to unknown for 2013/14 shipment under the daily reporting system. Strategie Grains estimated the global 2014/15 soybean crop at 298 MMT versus 287 MMT in 2013/14. 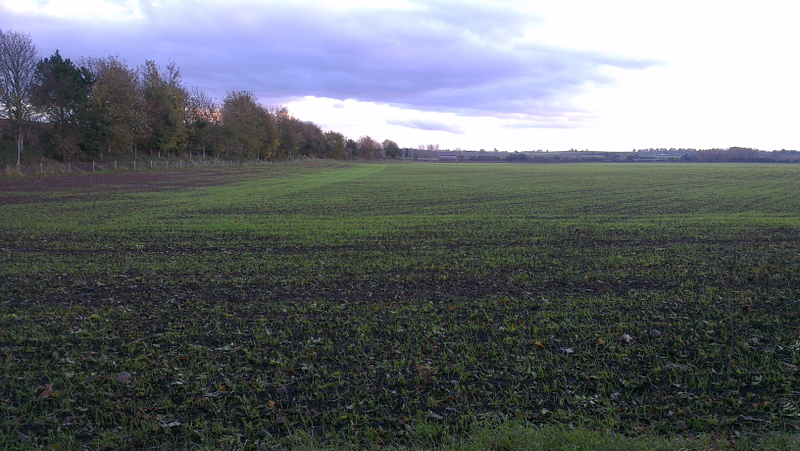 They peg the world 2014/15 rapeseed crop at 67.0 MMT versus a previous estimate of 68.0 MMT. Weekly US soybean export inspections were 45.43 million bushels versus 73.974 million last week - possibly a sign of a seasonal switch to South America, but maybe also influenced by the current bad weather restricting the movement of grains in the US. Mar 14 Soybeans closed at $12.92 3/4, up 10 cents; May 14 Soybeans closed at $12.78 1/4, up 9 3/4 cents; Mar 14 Soybean Meal closed at $434.00, up $7.90; Mar 14 Soybean Oil closed at 37.45, down 19 points. Corn: The corn market closed around 2-3 cents higher. The USDA announced 113,780 MT of US corn sold to unknown for 2013/14 shipment under the daily reporting system. Weekly export inspections of 21.644 million bushels were pretty uninspiring, and down from 29 million a week ago. Again, maybe this is as much due to bad weather in the US as anything else. "It was reported last week that FGIS inspectors in New Orleans were unable to inspect barges for a couple of days due to ice along the river (Mississippi)," said Benson Quinn Commodities. Neverthless, cumulative export inspections are 574.397 million bushels compared to 311.934 million this time last year. The USDA's FAS said that South Korea will import 9.5 MMT of corn this year, a 16% rise on last year, as cheaper prices of the grain encourage the displacement of wheat in feed rations. They cut South Korea;s wheat import requirement by 400 TMT to 4.1 MMT (and versus 4.6 MMT in 2012/13) to reflect that switch. They said that 3 MMT of this season's South Korean corn imports will come from the US versus 2 MMT in 2012/13. 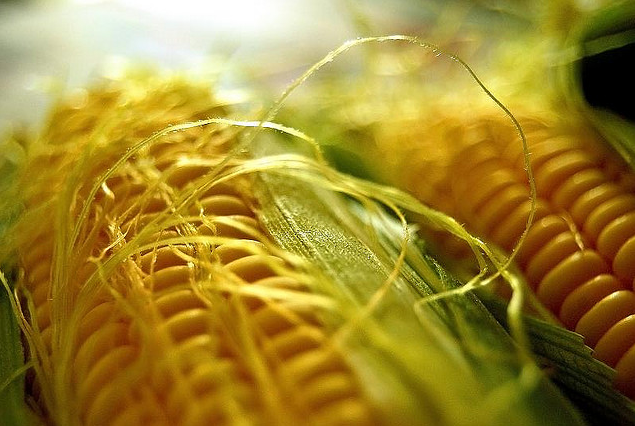 Ukraine said that it had exported over 12 MMT of corn so far this marketing year. The USDA attaché in Moscow raised their estimate for Russian grain exports this year from 20 MMT to 21.6 MMT, with corn shipments increased by 0.5 MMT from previously to 2.5 MMT. They've exported 2 MMT to date. The Russian port of Novorossiysk shipped 541 TMT of grains last month, a 42.5% decline on December. The total included 265 TMT of corn, with South Korea (237 TMT) the main destination. There are shipping delays developing due to bad weather and other logistical issues in both Russia and Ukraine at the moment. Mar 14 Corn closed at $4.35 3/4, up 1 3/4 cents; May 14 Corn closed at $4.41 3/4, up 2 1/4 cents. Wheat: The wheat market jumped around 6-8 cents across the three exchanges to start the new month in what may have been short-covering prompted by a bit of nervousness over the ongoing cold spell gripping the US. There could however be some relief in sight for the dry Plains. "A stormy wet forecast is welcome in hard red winter wheat, where winter weather conditions have been much drier than normal. Kansas, Oklahoma and West Texas have 'severe' to 'extreme' drought on the US Drought Monitor January 28. Drought has become 'extreme' on the High Plains the western third of the wheat zone. This area has a semi-arid climate but current drought is much worse than normal, "said Martell Crop Projections. It's been dry in the west too. "Coastal Washington state has received only 55% of normal rainfall this winter, and coastal Oregon just 30-35% of normal precipitation," they said. "Welcome rain and snow is predicted this week in Washington, Oregon and northern California easing severe drought. Previously a stable warm ridge of high pressure had prevailed blocking showers. The sudden change in the weather pattern is due to a southern shift in the jet stream now dipping south across the Pacific Northwest," they added. There's talk that Iran's 2013 wheat crop may have been massively overstated. The head of the nation's Farmer's Union said that production was only around 7 MMT. The current USDA estimate is 15.5 MMT. Iran may need to import 7.5 MMT of wheat this season versus a current USDA forecast of only 4.5 MMT, he said. Weekly US wheat export inspections were an insipid 11.65 million bushels, down even on last week's relatively poor showing of 14.63 million. Mar 14 CBOT Wheat closed at $5.63 3/4, up 8 cents; Mar 14 KCBT Wheat closed at $6.24 1/4, up 8 3/4 cents; Mar 14 MGEX Wheat closed at $6.10 3/4, up 6 3/4 cents. 03/02/14 -- London wheat traded firmer to start the week, getting a shot in the arm in afternoon trade when US markets opened and moved higher in what looks like a "new month, new money" move. Let's see how long the optimism hangs around for before we start shouting that the wheat market has bottomed. Mar 14 London wheat ended GBP1.30/tonne higher at GBP150.80/tonne, and new crop Nov 14 gained GBP2.25/tonne to GBP142.25/tonne. Mar 14 Paris wheat was firmer for much of the afternoon, but ended up closing EUR0.50/tonne lower at EUR192.00/tonne, Mar 14 Paris corn slipped EUR0.50/tonne to EUR173.00/tonne, whilst May 14 Paris rapeseed managed a EUR0.25/tonne gain to EUR364.50/tonne. Wheat has had a pretty tough time of it in January, so I guess that some sort of correction was due. London wheat finished last month 8.7% lower than it began it, with Chicago wheat down by 8.2%, and Paris wheat falling 7.5% during the course of January. London wheat finished at the lowest levels seen on a front month since late 2011 on Friday, whilst Chicago wheat posted a lowest close since July 2010 on Thursday night. London wheat traded higher from the off, supported by a weaker sterling after disappointing manufacturing data saw the pound fall below 1.21 against the euro and around a cent lower against the dollar versus Friday's close. UK manufacturing PMI fell from 57.2 in December to 56.7 in January, contrary to expectations for a small rise to 57.3, according to data released today. Cheap global wheat prices are flushing out some buying interest. Bangladesh today said that they would step up their wheat buying, tendering for 100 TMT soon. They've already bought 300 TMT on the international tender market this marketing year, plus a further 200 TMT in an inter-governmental deal with Ukraine. Indian origin wheat will likely be the favourite to win the Bangladeshi order. They are still actively selling wheat, and picked up bids around $270-275/tonne FOB in a couple of tenders over the weekend, which is still above the government's stated minimum of $260/tonne, although the gap is narrowing. The Indian 2014 wheat harvest is now only 6-8 weeks away, and a record 100 MMT monster crop could be on the cards. Next door, Pakistan said that they'd planted 8.82 million hectares of wheat, slightly shy of the government's target, but up 3.5% on last year. They are aiming for a 25 MMT crop versus 24 MMT a year ago. Russia said that they'd exported 942 TMT of grains in the Jan 1-26 period, including 542 TMT of wheat and 351 TMT of corn. Marketing year to date exports are 28.5% up on year ago levels at 17.327 MMT, of which over 13 MMT is wheat and more than 2 MMT corn. The USDA's FAS in Moscow increased their forecast for Russian grain exports by 1.6 MMT to 20.6 MMT, including 16 MMT of wheat (up 1 MMT) and 2.5 MMT of corn (up 0.5 MMT). Ukraine said that they'd shipped 21.5 MMT of grains abroad in the Jul/Jan period, an increase of 34.5% on last year. That includes over 12 MMT of corn, just under 7 MMT of wheat and a little more than 2 MMT of barley. In addition, they've exported 2 MMT of rapeseed and 0.8 MMT of soybeans. London wheat may have got off on a firmer footing to start the week and new month, it remains to be seen if the wheat market can gain any traction from here. Winter wheat in the FSU is now largely well protected by snow, and US wheat on the Plains is in for up to 8 inches of snow later in the week. 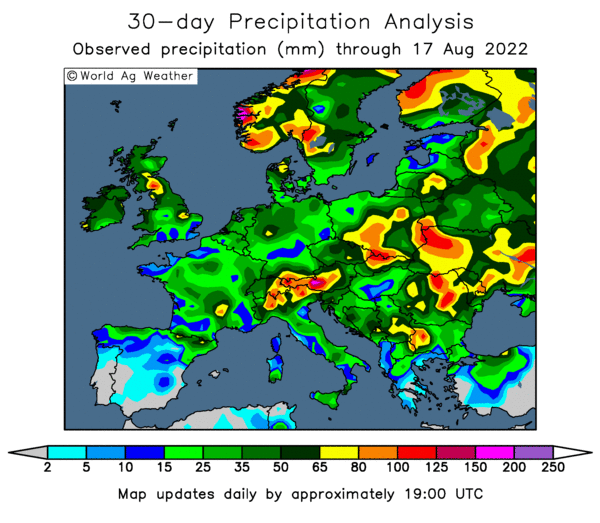 Parts of the EU remain too wet, although it's currently uncertain exactly how much damage has been done to winter crops. We are going to need a bit more of a weather scare than that to see this market put on some significant gains. The other options/hopes for the bulls are a demand-led rally and/or something to spark a round of serious fund short-covering in wheat (their net short in futures and options in Chicago wheat was around a meaty 90k contracts as of last Tuesday night - although it topped 100k in December). The bears will be riding the long-term trend line lower. Both London and Paris wheat have been in a down trend for more than a year now, and in the case of Chicago wheat the rot set in six months before that. In other news, French analysts Strategie Grains estimated the EU-28 OSR crop at 21.4 MMT versus their previous estimate of 21.3 MMT and up 2.4% from the 2013 crop of 20.9 MMT. 31/01/14 -- Soycomplex: Beans closed firmer in relatively quiet trade. China is closed for the next few days for the Lunar New Year celebrations, so maybe the market is thinking that will keep cancellations at bay for a little while longer yet? Yesterday's export sales report still showed China featuring as a buyer of old crop beans even if there were some decreases from unknown destinations. All eyes are now on South America: Brazilian harvest progress, Argentine weather, and how exports from the former will advance this month. Some are forecasting a February record 2.5 MMT of soybeans to be shipped out of Brazil you will recall. After that the trade will start to ponder on US soybean plantings this spring, with the USDA's Outlook Forum later this month due to give us a first initial projection on that. Allendale estimated the 2014 US soybean area at 81.6 million acres, up 6.7% on last year's 76.5 million. They said that Nov beans may fall as low as $9.20 by October versus $11/04 1/2 at the close tonight. A Reuters poll came up with an average trade guess for the price of CBOT soybeans at the end of the year of $10.76/bu, from within a wide range of estimates of $9.25–$13.75/bu. The Buenos Aires Grains Exchange said that Argentine soybean planting is just about done and forecast the 2013/14 crop at 53 MMT, unchanged from last week and 1.5 MMT below the USDA, although up 4.5 MMT (+9.3%) on last year. Cargill announced that they are to idle soybean processing activities at their facility in Raleigh, North Carolina, later this spring. 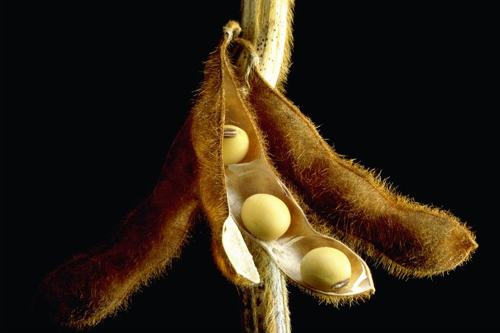 They said that "US soybean processing has become more variable and seasonally driven.” The plant may resume operations if conditions change, they added. 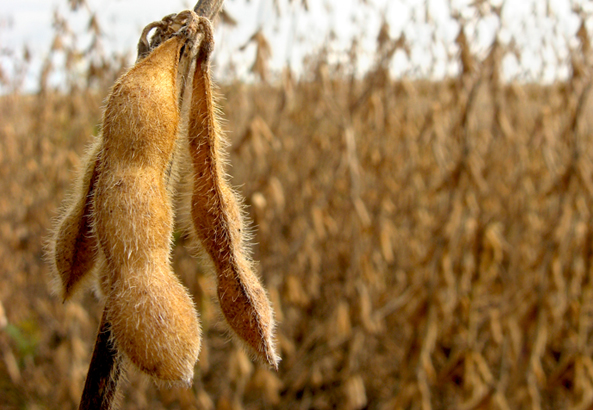 Mar 14 Soybeans closed at $12.82, up 7 cents; May 14 Soybeans closed at $12.67 3/4, up 6 3/4 cents; Mar 14 Soybean Meal closed at $427.70, up $2.50; Mar 14 Soybean Oil closed at 37.36, up 29 points. For the week that puts nearby beans down 2 3/4 cents, with meal up $2 and oil down 18 points to the lowest level on the continuous weekly chart since July 2010. Corn: The corn market closed little changed in narrow trade. The USDA flashed up a 110,000 MT sale of US corn to Spain for 2013/14 shipment under the daily reporting system - the second such sale in a week. It may be that the current political and civil unrest in Ukraine, along with frigid temperatures and logistical problems mean that more international buyers are looking to the US for their corn needs. The pace of US export sales is therefore supportive. As of Jan 23, cumulative corn sales stand at 86.5% of the USDA forecast for the current marketing year versus a 5-year average of 63.4%. Sales of just 157 TMT are needed each week to reach the USDA forecast for the season. Yesterday's sales topped 1.8 MMT. In short, corn seems to have found a level at which the record US and world crop is finding a home. Fund money is also trimming it's net short position in corn. The latest Commitment of Traders report shows them holding their smallest net short position (-52k contracts) since last July. Early thoughts are that US farmers may plant around 93 million acres of corn this spring, down on last year, but not by that much (-2.5%), despite US prices falling by nearly 40% during the course of 2013. A Reuters poll came up with an average anticipated US corn price at the end of 2014 of $4.37/bu, from within a wide range of estimates of $3.45–$6.00/bu. Mar 15 will be the front month then, and that closed at $4.59 1/4 tonight. The Buenos Aires Grains Exchange said that the Argentine corn crop is 95.8% planted versus 90% a week ago and 98.7% a year ago. In absolute numbers more than 3.16 million hectares have been planted versus an anticipated total of 3.3 million, they said. The Rosario Grain Exchange said that highly variable Argentine corn yields are likely this year - from only 4-5 MT/ha up to 8-10 MT/ha versus the USDA's current projection of an average 7.35 MT/ha. The USDA attaché in Brazil estimated the 2013/14 corn crop there at 70.0 MMT, down 13.6% from 81.0 MMT a year ago. Mar 14 Corn closed at $4.33, down 1/2 cent; May 14 Corn closed at $4.39 1/4, down 1/4 cent. For the week Mar 14 was 3 cents lower. Wheat: The wheat market closed around 2-4 cents firmer on the day, but 10-14 cents lower for the week. A bit of light pre-weekend profit taking may have been a contributory factor. The jury is still out on what damage may have been done to US winter wheat from a series of recent hard freezes, along with ongoing drought on the Plains. Recall though that crop conditions were far better in the last USDA report of 2013 than they had been a year previously - 62% good/excellent versus 33% at the end of November 2012. Bad weather in the Black Sea region, with high winds and heavy snow, may provide a short-term boost to US export prospects. So too could Egypt's new penchant for max 13% moisture wheat. The blizzard-like conditions around the Black Sea will ultimately provide protection from frost and a moisture boost later in the spring though. A Reuters poll came up with an average CBOT wheat price forecast at the turn of the year at $5.73/bu, from within another wide range of estimates of $4.75–$8.50/bu. Mar 15 CBOT wheat closed at $5.92 3/4 tonight. How the world wheat crop emerges from winter dormancy and spring/summer weather conditions will of course be the over-riding deciding factor on whether we end up at the top, or bottom, end of that range - or even outside it completely! Fund money isn't currently displaying a renewed appetite for returning to the fray to own ag commodities in 2014 with anything like the same enthusiasm displayed in some of the previous years of the last decade. That may remove some of the extreme volatility from the market at least. From the demand side the wheat market can draw some solace from the fact that in January we saw some large volume global interest in owning wheat. Egypt topped the list of international buyers last month, but Saudi Arabia, Algeria, Iraq and China too were all significant end users encouraged into the market to cover some of their requirements. Mar 14 CBOT Wheat closed at $5.55 1/2, up 2 cents; Mar 14 KCBT Wheat closed at $6.13, up 2 1/4 cents; Mar 14 MGEX Wheat closed at $5.99, up 1 3/4 cents. For the week CBOT wheat was 9 3/4 cents lower, with KCBT down 14 1/4 cents and MGEX losing 14 cents.